He can’t be bought. The proof: he’s down-home grassroots Texas, & makes practically no money at this. For what it’s worth, if it’s any consolation, his tough luck is our good fortune. Saying he makes chocolate would be the equivalent to Steve Jobs plays with electronics. 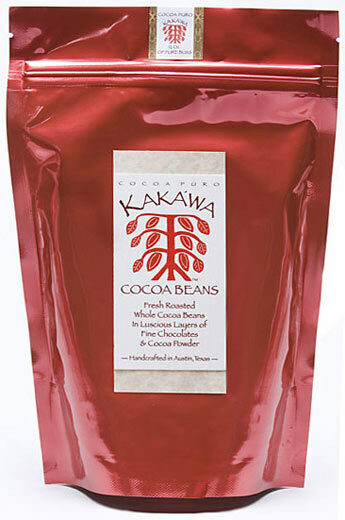 He re-invents the stuff - by paying homage to its ancestral roots, hence calling these Kakawa, the earliest-known name for cacáo, coined by the Olmec civilization, among the tree’s earlier cultivators. No pretty boy molds here or sissy wrapped candies. Pedersen goes for the motherlode – the whole bean. Basically a multi-tipped ballistic missile – specifically, 5-warheads in a single shot - starting with roasted cacáo beans enrobed in layers of the 3 chocolate amigos - White, Milk, & Dark – plus cocoa dust to finish it off. His delivery system is smoother than a croupier sliding dice across a craps table in Monte Carlo for you to handle & blow a kiss on before rollin ‘em over the felt table of your tongue. A total sensory wraparound so your act of chewing does all the blending. Call it ‘Chocolate 5th Dimension’ or C5-D for short... quite possibly the nearest thing on earth to the 19 dimensions of quantum physics’ string theory. About as resistible to the teeth as crunchy buttered popcorn & as close as you can get to the source without being part of the raw-food tribe/body temple cult that downs 40 to 50 raw beans as a precursor to their ayahuasca orgies. Sugar-coated confectionary components never clash or confuse, just influence the progression even as they recede into the process, always providing a soothing touch for what you’ll comfortably diagnose as benign beans of midpoint roast & ferment, producing at the back-end a light-handed torrefaction drawing out subtlety & finesse of its Criollo heritage. br> Brilliant concept that hits the middle stroke between satisfying coco-scenti who know good taste, & placating the mass-market cravings for pop-food flavor.